My aunt had been into ‘spirituality’ for quite a while. She was following a master and organization where a ‘succession plan’ was in place. Her master had already appointed an heir apparent and the disciples were assured of continued leadership and guidance. And her master was not even in his sixties then. It was natural that she felt that Bhagawan Baba had pushed the ‘successor planning’ for too long! But things are bound to be different when God Becomes the Guru! The answer surely surprised my aunt but she was also impressed with my conviction. Today, when I look back to the episode with my aunt, it makes my hair stand on their end. I am simply thrilled at the ‘wisdom’ that exuded from my mouth without me even knowing it. And that definitely has to be His grace alone. True to that statement, His love, grace and guidance have continued to flow on me and everyone else too, even after the Mahasamadhi (shedding of the mortal coil). The recent trip to Brindavan, Swami’s ashram in Bangalore, for a music programme provided ample evidence of this loving hand of God. Before diving into the wonderful happenings of the evening, it is in order to make a mention about the National Workshop on Bhajan Singing that was held for two days at the same ashram. The ‘One with Sai’ concert was to be the icing on the cake that the Bhajan workshop was. The workshop brought together bhajan coordinators from all around the country, some of the best bhajan singers from the Sai Samithis in the country and some of the pillars of Sai bhajan singing who have had the privilege of being trained by Swami Himself! There were talks, presentations and panel discussions which highlighted the beauty and wonder of Sai bhajans along with educating everyone about Baba’s vision, expectations and discipline of bhajan singing. Needless to say, all these were liberally peppered with incidents and experiences with Swami that left indelible impressions in everyone attending the workshop. Many of the instances narrated there showed how Swami did not need a ‘physical form’ to communicate with or bless a devotee. That programme truly took the ‘cake’ as it brought alive memories galore. I just wished my aunt could have heard all that was said there - she would have got a glimpse of how Swami has His own ‘succession plan’! Then came the concert in the evening. The singers were all alumni of Swami’s University currently working in various institutions at Puttaparthi. Each name in the singing line-up – S. Ravikumar, Ashwath Narayan, Koustubh Pare, Ameya Deshpande, Siddartha and Anirudh represented at least a decade of singing in His physical presence. I cannot say whether their singing took the audience to Swami or brought Swami to the audience - this much I can say that it was simply divine. There was not a single eye in the whole audience (of more than 2000 people) that was not moist. One could simply feel Swami in the air. And then, it happened, when Swami, in His typical fashion, concretized His presence in a thumping fashion. The episode happened in a very sudden manner. Exactly when he said, “When Swami says cut...”, a foot long garland which had been wound and tied on the crown of the huge Krishna idol on stage, snapped and ‘flew’, falling a foot away! The timing was impeccable. Swami definitely must have been smiling. Once again, I wished my aunt could have been present to experience what 2000 people had just experienced - the presence of their Master! As I said, the concert was an icing on the cake. But the cherry on the icing had been reserved for the late evening. It was Mr. Vinay Kumar, a man of several accomplishments and also the caretaker of Swami’s Brindavan ashram, who directed me towards my ‘cherry on the icing’ experience. 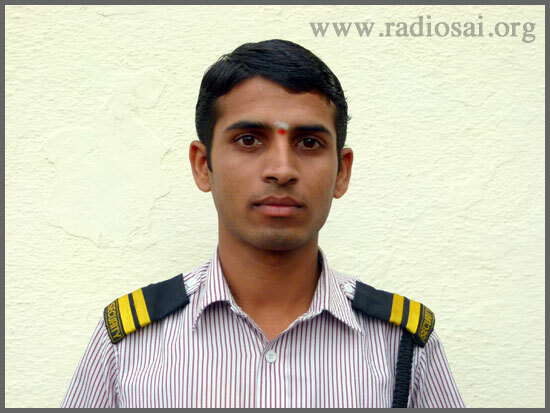 Anand Bommavagol is a 22-year old lad who is part of the six-member security team at Brindavan. His duties are specifically concerning the security of the Trayee Brindavan (Bhagawan Baba’s residence building) compound. He was very cheerful when I met him and had a bright vibhuti dot on his forehead. His first few sentences were enough to arouse my curiosity and interest. I simply forgot the fact that my taxi to Puttaparthi was waiting. I patted him and asked him whether he was ready to share his experience. He smiled and continued at a nearly breathless pace. It was evident that memories of his experience were still making his heart race. And once he told me the story, my heart too was racing with excitement and gratitude. Anand hails from Kalloli in Gokak taluk of Belgaum district, which is located in the north-western corner of the Indian state of Karnataka. He completed his high-schooling and was working as a security guard near his village. He had seen pictures of Baba in his village samithi but always looked upon them with contempt and doubt. It was late in 2012 when he had a strange dream. The bus then left and Anand woke up from the dream. It was as if Swami had come to ‘pick’ him because he refused to go to Him! Anand still wanted to refuse but his mother was insistent that he leave immediately. “You don’t worry about me. God will take care of me. As for the money, ask my brother to spare you a thousand rupees,” his mother replied. His mother’s word was God’s word for Anand. He did as she said. However, he returned from his uncle’s house, disappointed. “You just get packed and be ready. God will show a way,” was the mother’s reply. It was a pleasant shock when Anand received his uncle at home, early next morning. His uncle handed him Rs. 1,200, not as a loan but as a gift! Taking blessings from his parents, Anand left for Bengaluru from Belgaum. 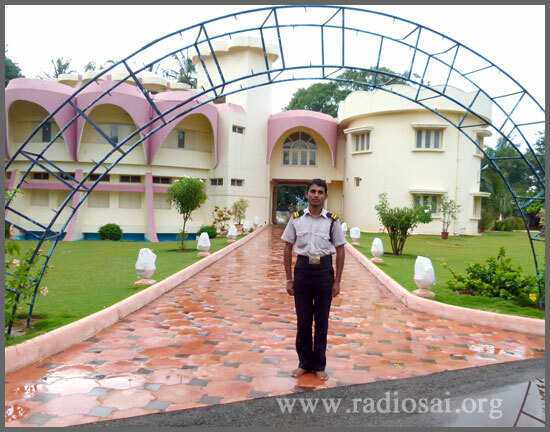 Anand was sent to the state of Tamil Nadu to receive training from the unit of the Sri Sathya Sai Organisation there. 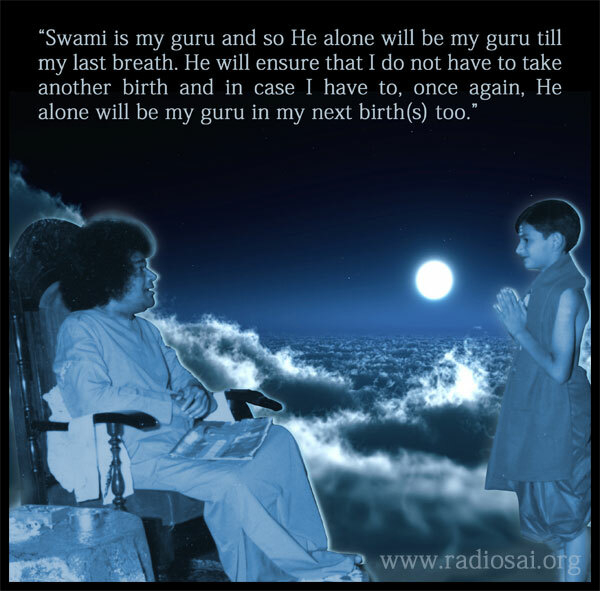 During his training of two months, he got to know more about Swami. He got his first taste of Swami when, one day, he could feel a fragrant perfume in the air. He was beside a photograph of Baba and he wondered whether the fragrance was emanating from there. Even as he wondered thus, he looked at the picture. It began to pour out vibhuti in front of his eyes! Anand just heard him out. Though he had been stunned, he wasn’t ready to accept Baba as a god! He completed his training and was assigned duty at Trayee Brindavan on Sankranthi day (January 14) in 2013, a very auspicious day when the sun begins its northward journey. Swami says that this is the time when man too should begin his journey Godward. That seemed to be His plan for Anand too. “Everything about the job was good and nice. The people were very nice and the place was simply beautiful. Only two things bothered me - one was the fact that my mother was still ill and the other was that I could not take a man to be God!” said Anand. And that was when he decided to test this Baba by throwing a challenge to Him. The ante had just been upped! Though Anand was upset and angry, he continued to keep his end of the ‘deal’. The circumambulation continued for the next four days. The fifth day happened to be a Thursday in March 2013. As Anand went around the Trayee building in the middle of the night, he was very upset and angry. Though the deadline had not elapsed, he had already started scolding, cursing and shouting at Swami. That was when, he suddenly saw something move in the shadows. He was baffled. 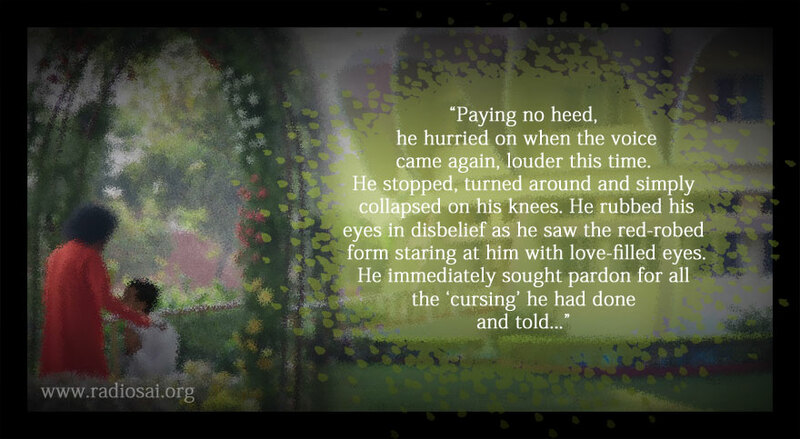 Who could it be when he had locked both the gates securely? Swami continued to smile and then, a few moments later, He was gone. “How was he?” I asked Anand. “Are you sure you didn’t imagine that” I asked, rather audaciously. A tear dropped from Anand’s eye. It was a tear of joy.